©2012 John G. Hemry (P)2012 Audible, Inc. I remember when the author first announced his signing a deal for two spinoff series to follow The Lost Fleet about three years ago. Since then, Lost Fleet has come to a close and Beyond the Frontier has been through two volumes, and what was originally referred to as The Phoenix Stars has just seen the light of day. 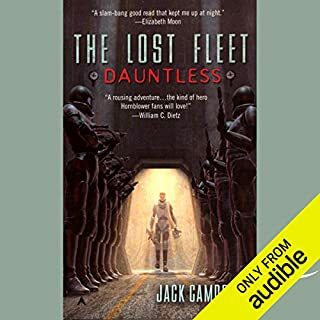 As the first reviewer notes, this book adds little to the Lost Fleet narrative, but succeeds quite well at expanding the universe through which the Alliance Fleet has rampaged since Dauntless's publication half a decade ago. The Lost Fleet was the author's third series, and the fact that its characters and geography have made it into further stories beyond the Alliance Fleet's escape from Syndic space is a wonderful thing, even if at first blush that is only to add greater depth to the snapshots of life in one system through which the Alliance fleet has passed through in the last three Lost Fleet novels. Though it is technically the beginning of a new series, Tarnished Knight leans heavily upon the original Lost Fleet series and its continuation, Beyond the Frontier. The events in the Midway star system occur after those depicted in Dreadnaught. This entry features more space battles and ground combat from the Syndic perspective, as the Midway system battles various internal and external threats. But where the Lost Fleet series proper often turns on fleet politics and combat logistics, Lost Stars deals with the aftermath of revolution and the tenuous balance maintained by two strong leaders with complementary power bases, who both need one another and have the means to bring about the other's undoing. The problem is that we already have the outlines of this story by virtue of the glimpses we've received through Dreadnaught and Invincible, thought it can be interesting to see just how things came to change between visits. Meanwhile, the author dangles the prospect of further developments in Alliance space in the next Beyond the Frontier entry, titled Guardian and due next year as usual. The perspective of this story is a bit different given that there are two point of view characters. The author maintains a style similar to Lost Fleet though, with great tactical details, scheming, and occasional humorous interludes. Mark Vietor is terrific as always. For those who have come to associate the voice of Christian Rummel with this universe though, be prepared for slightly varied pronunciation of some character and place names. My wish that Rummel would have been tapped for this series is the only reason for four stars as far as the performance goes. I can't imagine why one would read this without having read the eight Lost Fleet and Beyond the Frontier books first. If you have though, I think you'll find enough of what made those stories winners to satisfy with this new slant to the universe. Little gems about the Syndic way of doing things like the one referenced in the title are almost worth the price of admission alone. 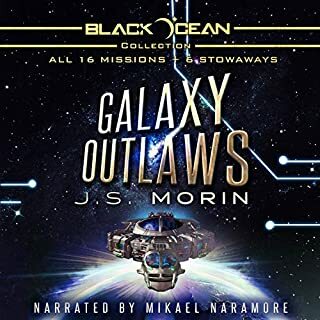 I got hooked on The Lost Fleet and then Beyond the Frontier Series and now a new great sub series about the Midway Star system. The story picks up with life on Midway after Geary leaves Midway into the unknown space to explore it. The Midway Star System has declared independence from the Syndic and are forming a new government and alliances of neighbouring star systems. 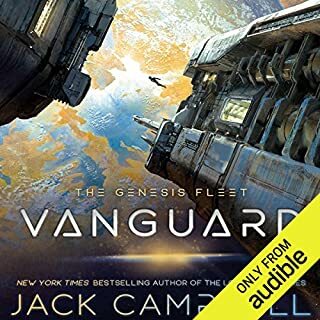 Jack Campbell's usual great space battles, intrigue between different groups all goes into creating action, suspense and the ending leaves me wanting the next volume in the series. If you like the other two series you will enjoy this new one. The story is almost as engaging as the Lost Fleet books. However, if one hasn't read the Lost Fleet books the story and setting could be a little confusing. Marc Vietor's performance was good but not great; at times it was hard to distinguish the different characters. Christian Rummel has a much larger range of character voices and I wish he were narrating the Lost Stars as well. Overall a good beginning to another series of books from Mr. Hemry. Great audio performance. Clasic space-opera. Interesting characters.I couldn't decide whether to love or hate the characters. If you could sum up The Lost Stars: Tarnished Knight in three words, what would they be? I won't state one so I don't spoil anything, but in general, my favorite scene were when the main characters were trying to figure out each others angles and if the other could be trusted. The book is similar to what the fall of the USSR was like for people. Russian's lives were dominated by government their whole lives, and once it fell, they had freedoms but didn't know what to do with them. Take the make characters as Ukrainians that have just left the USSR but have to fear Russia's heavy handed tactics that are not limited to economic or political aggression. Good story for the most part but too much politics with a mix of silly intrigue. Battle action very good. After reading the Lost Fleet series, I had high expectations going into the offshoot Lost Stars series. I was left with a sense the story seemed to move more slowly than it's parent series. Thus 4 out of 5 stars. However, the novel is solid and left much to build upon moving forward. Our main characters have been established and I continue to have high expectations for the series as I continue with this new universe in book 2. I just want to applaud Jack Campbell for expanding his Lost Fleet universe in this direction. I've always been a sucker for the reluctant hero, and in this story you get 2. The portrayal of CEO Drakon and Iceni as they try to survive the downfall of the Syndicate Worlds and in the process become heroes that you can easily identify with is truly an enjoyable experience. The plot line, of course parallels the story of the Lost Fleet series but from the other side. This makes the events in the last couple books in the Lost Fleet series much more understandable. 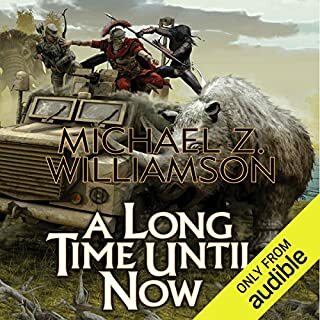 The action is great, as always with Jack Campbell, but it is the twists and turns and intrigue that really draws you in. I also liked the fact that Jack Campbell portrays his Heroes with all their warts and how they struggle, inspite of them, to make a better world. So if you liked the Lost Fleet Series you're definitely going to like this book. New characters with muddled values create intriguing relationships that keep you hooked. Never trust and always verify. Tarnished Knight is a real step forward for Campbell [Hemry] in my opinion. More than in any other of his books in the Alliance/Syndic universe, we the reader actually get some genuine depth to the main cast of characters. When there is introspection it is worth while in the majority of cases. Whilst the earlier novels made for good military Sci-fi they at times they came across like a commentary. This might a controversial statement to fans of the series, however after reading this i think i like Gwen Iceni's character over Geary or Desjani and Rione's nowhere by comparison. I hope that Iceni continues to receive dur prominence and is treated well by the author. a good start to the story. interesting to see what the characters are thinking and doing. I didn't really really enjoy this book as way to much time was spent people questioning them selves and being told everyone's thoughts and why they were thinking it. An enjoyable, easy to listen to, series and one which I will follow. Sometimes you just want to listen to something which is not too complicated and, more important, has good narration. This is my first experience of Marc Vietor and I have been pleasantly surprised. I will certainly look out for this narrator again. Excellent storyline but narration poor!! 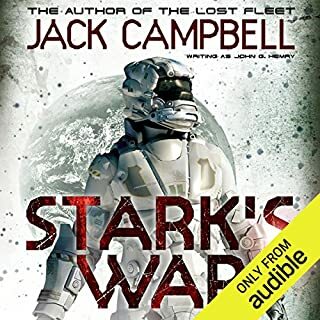 I love the Jack Campbell books and listening to the excellently narrated black jack books I was looking forward to this. The story is great but the problem I found was that the narrator doesn't differentiate between characters well. It was difficult to keep track of what character was talking at times and I've now reached the end of the first book not knowing the characters as well as in the first set of books. yawn. would give it back.if i could. total waste of my time. all descriptions and no story. 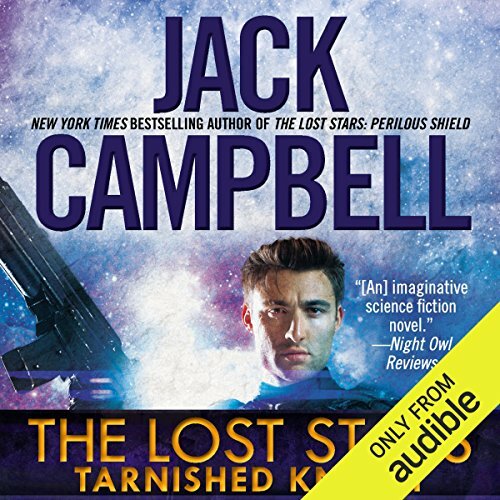 Where does Tarnished Knight: The Lost Stars, Book 1 rank among all the audiobooks you’ve listened to so far? General Drakon, come on, with a name like that he'd have to be everyone's favourite surely! 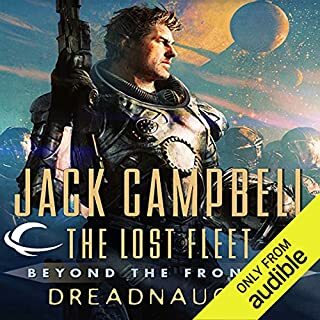 Whilst the lost fleet is a good fast paced naval drama, this series builds on that story to incorporate the additional challanges faced by a leader who can't sail off into the distance and leave their woes behind them. Makes for a great addition to the whole series of books. I picked this up as a random buy as it was cheap. It's slow to get moving but I got quite into it. He tries to write some diverse character and there is a strong female lead but still we see reliance upon standard space opera tropes such as the slinky psychopath female. Even with that said I have to admit I'm about to buy the second book as the overall world story is quite interesting.